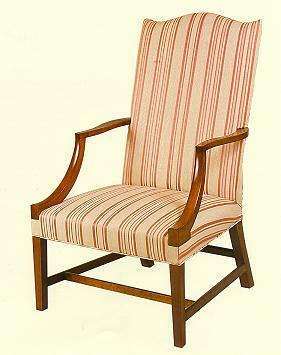 Our American Federal ClassicsTM replica New England lolling chair is made of native figured cherry, with a graceful high back and a serpentine crest. The shaped arms are supported by sloping arm supports which continue into square tapering front legs with an "H" stretcher base connecting the raked square back legs. The chair is remarkably simple in design yet sophisticated and successful in its scale and proportion. This handsome chair is easily used either in the home or in a commercial environment where high back seating is desired.